Since the Perth Mint launched its Lunar Series II in 2008, it has become one of the most popular options for both collectors and investors. 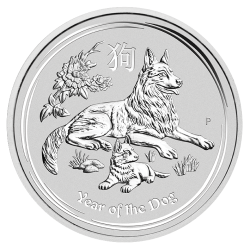 Annually changing reverse designs are based on the characters of the Ancient Chinese Zodiac while the obverse carries a portrait of HM Queen Elizabeth II. The collection began with the Year of the Rat in 2008 and will end with the Year of the Pig in 2019. Silver Lunar II series coins are available in a range of sizes so they're an affordable option for both new and established investors. Each coin is struck from .9999 pure silver and finished to the highest standard and, of course, all Lunar II silver coins are legal tender with a face value in Australian dollars.